CocoTherapy� is a product of Oscar Newman® LLC. _ 2009. All Rights Reserved. CocoTherapy� Organic Virgin Coconut Oil and CocoTherapy� Organic Coconut Chips. 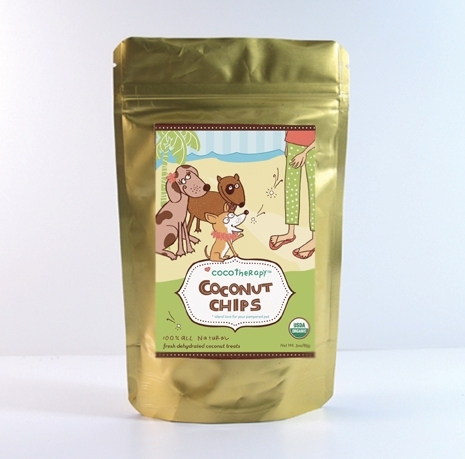 A delicious treat for your dog or cat, CocoTherapy� Coconut Chips are made from dehydrated organic coconut meat. The dried coconut flakes are made of pure, 100% organic coconut meat, with absolutely NO sugars, salt, preservatives, or chemicals added. CocoTherapy� Coconut Chips are an excellent source of dietary fiber and provide the same benefits as coconut oil. All our pets absolutely love the rich, slightly nutty taste of the treats. Give a few treats throughout the day, or sprinkle in food. Virgin coconut oil is comprised mainly of a medium-chain fatty acid, called Lauric acid. Lauric acid is responsible for many of the health benefits of coconut oil. The only other abundant source of Lauric acid found in nature is in human breast milk. The medium-chain fats in coconut oil are similar to fats in mother's milk and have similar nutriceutical effects. Coconut Chips is an excellent source of dietary fiber, and provide the same benefits as coconut oil. CocoTherapy� Coconut Oil and Coconut Chips come from fresh organically grown coconuts from a USDA certified organic coconut farm. The coconuts are harvested fresh and are opened between four to eight hours of harvesting. The fresh coconut meat is then air-dried in a cold dry environment, and cold-pressed to express the healthy and pure coconut milk. The oil is separated from moisture in a process called vacuum drying, with low processing temperatures that are approximately 100 degrees F. Usually, coconut oil that is considered "excellent� has a 0.04% - 0.11% moisture content. Higher moisture content not only lessens the oil's shelf life, but also makes the oils more susceptible to oxidation, bacteria, and the breakdown of triglycerides. 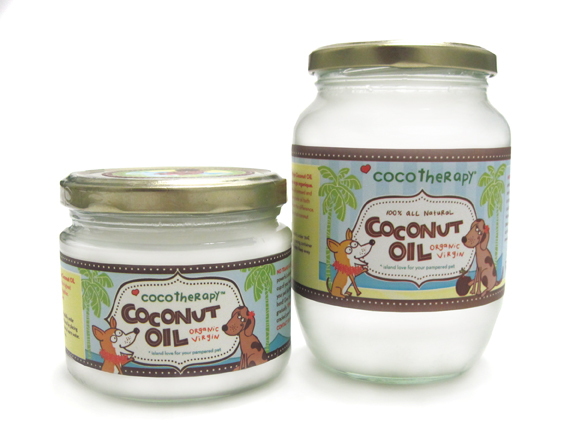 CocoTherapy� coconut oil has a moisture content of only 0.02% - 0.08%. Our process enables the enzymes, vitamins, minerals, and nutritional benefits to be preserved, resulting in a raw coconut meat and oil that tastes fresh, has wonderful texture and smell, and contains all the health benefits of fresh raw coconuts. You can see, smell, and taste the difference! CocoTherapy� products are certified organic by the Global Organic Alliance, Inc, a USDA accredited certifying agent. Look for the USDA Organic seal on our package. Severe dog itching, skin allergies, mange, black skin disease and hair loss, hot spots, dandruff or seborrhea, cuts and sores and other secondary dog skin problems resulting from flea or mite allergies and even trauma � these conditions are miserable for your pet, and for you. Until now, it's been difficult to treat these common problems without steroids, antibiotics or strong chemicals. Here are the four steps to relief for your pet, and for you. For general itchiness, hot spots, seborrhea, or even in severe cases of black skin disease (Alopecia X) or significant hair loss, massage the soothing lotion well into the affected areas twice daily. Slip a soft t-shirt or similar covering on your pet to ensure that the lotion remains on the skin. When disease is under control, switch to Hot Spot Salve to treat stubborn or difficult-to-heal sores or spots. As the skin heals and fur begins to grow back, massage in DERMagic Cell Restoration Cr�me as needed to soften and protect new skin, to complete the healing process and to combat dry, flaky skin. This step speeds cell regeneration and boosts cellular immunity to prevent reinfection. It's great for cracked pads or chapped noses in winter and scorched feet in summer. As a special treat for your pet, or just to eliminate dry skin and dandruff, Dead Sea Antidandruff complement the DERMagic System and enhance its healing properties by providing deep exfoliation and detoxification of the skin just prior to bathing. And the therapeutic essential oils are both relaxing for your pet and stimulating to the skin. The wait is over. Safe, effective relief is here. The DERMagic Skin Care System now comes in two sizes; just let us know which you prefer.